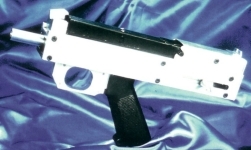 JFrom Defense Review.com Another small arms designer developer, Walter Balsavage Jr. (of Marshal Arms, Inc.), has his own PDW concept in the works. 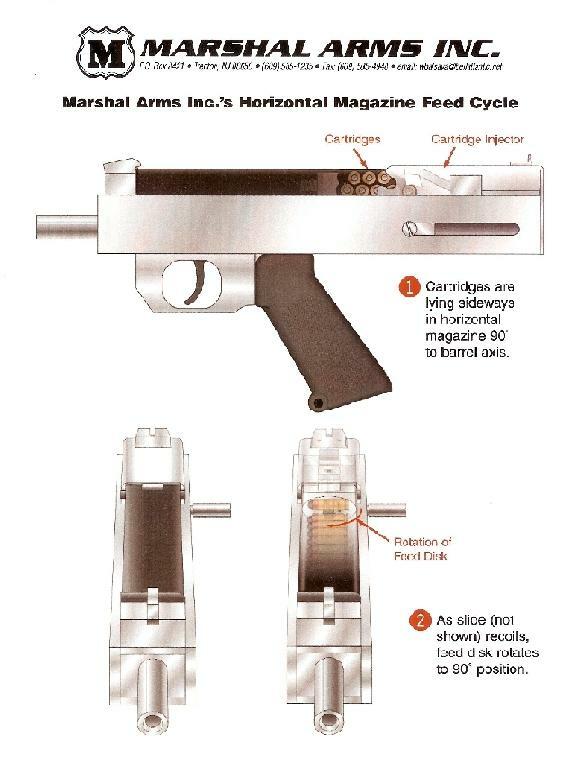 The "Marshal Arms Pistol" mates the P90/Hill submachine gun top-situated, horizontal-oriented magazine and rotating disc ammo feed system with the size envelope of the SCAMP and Arm West PDW. As his PDW concept's name implies, Balsavage shares Jim Sullivan's belief that a PDW should be sized like a pistol, so it's holsterable and thus can be carried by all. Balsavage already has a functional prototype of his Marshal Arms Pistol PDW, and this prototype weapon has already received some positive (written) feedback from the U.S. Army TACOM-ARDEC's Close Combat Armament Center. The author will expound more on the Marshal Arms Pistol in a subsequent article, which will include a host of interesting Marshal Arms materials (made available for viewing). In the meantime, you might want to read Mr. Balsavage's paper on PDW's, which he submitted to the NDIA at their 2000 Joint Services Small Arms Symposium. The paper is titled "Personal Defense Weapon: Only for Defense?". This is the original promo material the company put it, it doesn't mention the Hill SMG anywhere in it. A number of weapons have explored the helical design, Calico, Giat, FN but none have ever cited any links to Hills work.